Today started with some wild weather at the nest. Thunder-snow was in the area and Mom hunkered down to protect the eggs from the elements. 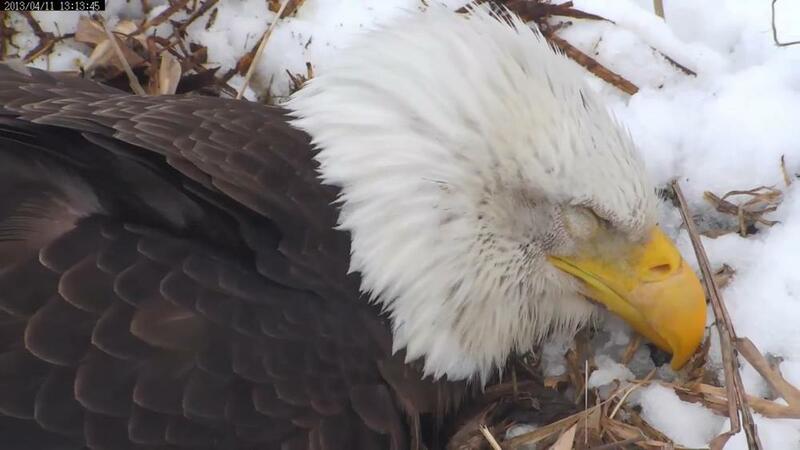 I was awake about 4:45 nest time and caught this snap of mom buried in snow. The snowglow lit the nest fairly well. About 6:20 am Razzle found her in even more snowy straits. About 6:30am she stood up and tried to shake off all the snow. About an hour later the cam gnomes at BBC decided a little panning would start the day right. We could all see how cold and nasty it really was in the nest area. Thanks BBC! Another hour later approximately 8:25am Dad came to the nest to keep her company for a while. They both looked a little miserable with snow stuck to their beaks and faces. BBC panned for us some more as Dad moved around on the nest. His feathers were taking a beating in the vicious wind. Some more pics of Mom with ice and snow on her beak and eyes. Dad finally relieved Mom late morning and she flew away to warm up and flex the kinks out from sitting all night. Dad sat the nest for about an hour and a half . Mom returned to take over again. As usual Dad was reluctant to give up his seat. He finally left and went to Sticks Depot and came back with a doozy! Mom had been napping after her ordeal but put up with his OSD to get him away from the nest quicker. She kept the warm seat and Dad left for his perch. In the afternoon the weather improved a bit and Mom decided to nap the day away. One of our chatters caught her napping for us. She napped the rest of the day away. BBC came back and panned for us some more in the early evening. Mom stood and showed us the eggs for a moment. Some chatters went wild and thought they saw a pip. Turns out it was dirt and to top it off it was on the wrong egg. Oh well! Well, we are starting PipWatch tomorrow as one never knows with Mother nature. The mods and all the chatters will have their eyes glued to their monitors for any sign of a pip for the next few days. Here’s hoping it comes sooner than later! Well that’s about it for today on the nest. It was a wet and wild day and we sincerely hope the weather improves for Hatch Weekend!